In last tutorial “CRUD Operations in PHP with PDO using Bootstrap” I have given details on how to handle crud operation in PHP with jQuery, here we are going to try something new from the market and most usable in the real time application that is AngularJS. 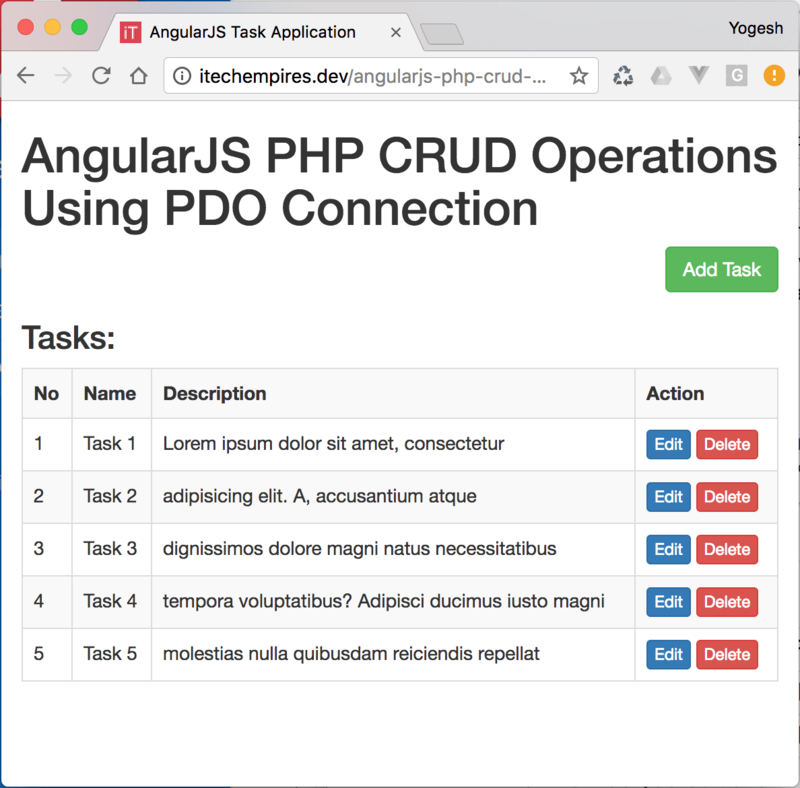 To demonstrate AngularJS usage I am going to use a simple example of Task application, so here we will build a very simple Task application where we can Add, Edit, List and Delete the Task. bootstrap: as name suggest this directory will have files related to bootstrap framework, you download bootstrap file from getbootstrap.com or those files will be already available with this tutorial source code. script: This directory is having all required files for crud operations including library file and Database connection file. 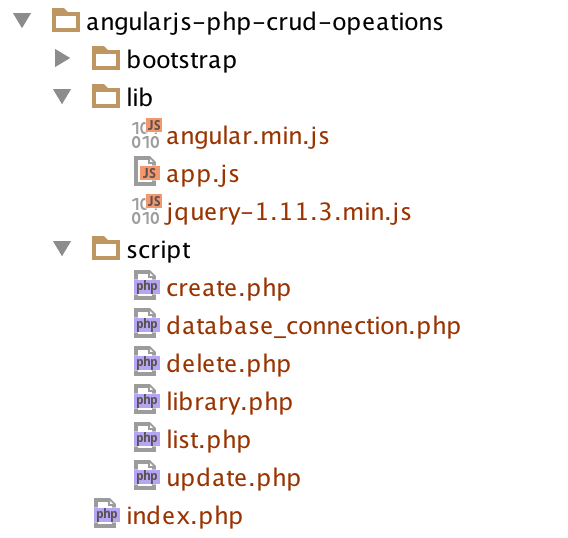 Index.php: application index file where we are going to have our CRUD application templated loaded. When we need to interact with the database to store and read data from the script of our application we need to write a connection script to enable a connection between application and database, so go ahead open up the database_connection.php file from the script folder and simply add following connection script to the file. In the above script we are having a connection to MySQL database using PHP Database Object, I have added DB() global function to use thought our future script which will be there in the next steps. Let’s write php code to handle create, read, update and delete operations, we are going to write Object Oriented Code to just make you familiar with. If you are a php beginner it will be great step for you to understand the basics of it. Ok go ahead and open up the library.php file from the script folder and add following library script, you can find the explanation after this script. 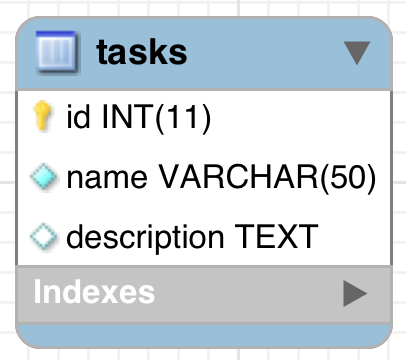 At the very beginning of the script you will find the require section where I am adding database_connection.php file to the library file so that we can access the database global function to communicate with the database. Next we have a opening of Class Task and then the declaration of $db variable which is having protected as a prefix which is called access specifier to control the access of the variable, in this case we are just allowing $db variable to use in the Task class or it’s Sub classes. __construct(): as name suggest we have constructer defined to initialize variables. Create($name, $description): This is method is used to create Record/Task into the database, it requires two arguments to pass while calling the method. Read(): Used to read the records from the database. Update($name, $description, $task_id): Used to Update the existing record from the database and It required a three arguments while calling. Delete($task_id): Used to delete existing record using Task ID. If you notice we have added very simple html code here, at the very beginning in header section after page title we have imported bootstrap CSS file as we are going to require that for the design. Next.. in the body section we have our JS file loaded at the bottom, jQuery, AngularJS, Bootstrap and our own custom JS file called app.js. So we have our basic setup is ready, to revise the tutorial as of now we have our database up and ready, Database connection, Library file along with the required CRUD function are all set and now we just did the index page setup, all right let’s get to the next step to complete this demo application. To read the records from angular JS we need to setup a function into AngularJS controller and call our php api to access the records from the database. If you notice we have bit extra design already added such as Add Task button and Edit and Delete button along with the ng-click events right? don’t get confuse we are going to see that next just stat with me. i.ii) Function to execute when user clicks on update details button from the update modal popup. We are done.. go ahead run your AngularJS application from your browser let me know if you find any errors or issue running the application, simply commenting using following comment section. It should work, checkout twice there might be issue with database connection or in to the query execution.